I was visiting Sedona when a friend and I had just attended a Christmas Eve Service, December 24, 2000. As we got out of the car, we saw this huge spinning Orb which was more unique than anything I had ever seen in all my UFO footage. This Orb looked like a spoke of wheel, and you could see each spoke clearly as was spinning over the top of the neighbor's home. This UFO made me think of the Star of Bethlehem. As I began to film it, would shape-ship from an Orb to the Spoke Shape....like a sparkler. I began to communicate with it, asking questions...it would change shape each time I would ask another question. My friend could see the same images, rainbow changing colors, and shapes with her physical eyes. are similar to images in ancient pictographs and tablets. They represent the Language of Light spoke of in the Keys of Enoch, by Dr. J.J. Hurtak. These profound images are included in our Movie "Encounters with Angels, UFOs and Divine Encounters." As a person watches this incredible encounter, they are activated on the deepest levels for transformation of their "Whole Light Body" to begin to merge with their physical body. This is a process we are going thru in this dispensation of time. 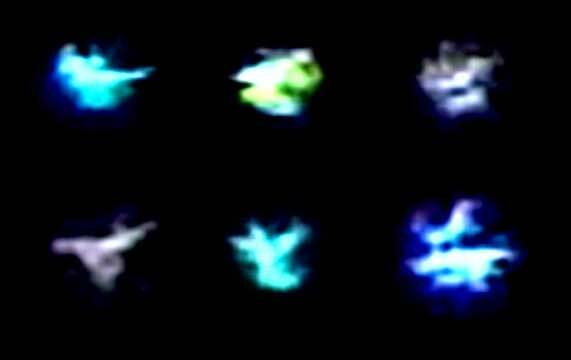 Many individuals have expressed receiving healing energy and enhanced intuition from watching this UFO footage. I even began to sing, and it danced in beat with the song of Hallelujah chorus. I believe this vehicle could be representing the “Chariot of Ezekiel” as spoken of in Zachariah Sitchen’s book, DIVINE ENCOUNTERS. This vehicle remained with us for 15 minutes. When studying this film footage, I have discovered some truly amazing phenomena revealing images which I believe are representing the STARGATE and PORTALS in SPACE. The pictograph images show in the following photographs all transpired from this single encounter on December 24, 2000. Each pictograph is telling a story, OUR STORY, helping us to remember who we are, where we are going, and what we have to look forward to as the NEW EARTH MERGES WITH US. I like to share this so you can see the comparison of the images appearing within just a few minutes of filming. I have found there is healing coming from these images. This display can be ordered and you can place it in your home for healing energy. It is like the images are ALIVE…which brings the Merkabah to you, energetically.